Sun Yat-sen was born on November 12, 1866. At the age of 13 he went to Honolulu with his elder brother. In 1883 he came back to China and was astonished by the ancient healing methods used in the Chinese villages and decided to become a doctor. 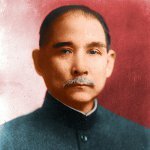 Around 1888 Sun Yat-sen started paying attention to politics and joined a group of revolutionary thinkers. In 1895 he led a coup, that failed, and he had to go to exile. In 1900 he launched another uprising, that failed again. Finally he organized a sponsored uprising in 1911, that eventually led to the Xinhai Revolution and overthrow of the last Chinese Emperor Puyi. Sun Yat-sen became the first provisional President of the Republic of China. Sun Yat-sen's Birthday is an unofficial holiday, that is why no special events are organized in Taiwan. It's mainly marked by the remembrance speeches, delivered by the politicians.